Finally, an available book on Germany's greatest soccer club, whose very name strikes fear in the heart of footballers everywhere. A nice collection of photographs following the history of WSV and its predecessors. The photos are great, but they are all black and white. That's OK for the older ones, but it would have been nice to have some color, especially for more recent years. Also, it would have been nice to have things like the various club emblems in color. The other weakness is that there is minimal text. While the book is divided in chapters, there is no accompanying text. The commentary is based on the photos. While that does do a good job in explaining things, there are lots of gaps that could have been filled in. Also, the whole Nazi period is pretty much glossed over, although the field performance wasn't too bad. 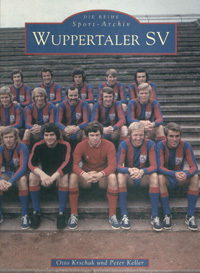 There is a dedicated chapter on WSV's greatest player, Horst Szymaniak. He was certainly the most talented player ever to wear the WSV jersey, although fans from the early 70s are also partial to "Meister" Pröpper. The most recent era is not neglected; indeed the penultimate chapter is entitled "From the 2.Liga to the 4th Liga". The last "chapter" is merely a one page statisical table. Of course, the photographs are the strength of the book, as most of them cannot be seen anywhere else. Certainly it will bring back memories to long time fans.